Helping you prioritize, stay organized, and focus on what's most important in life. Goal Striver is a goal setting to-do list app. It enables you to set goals, prioritize your tasks, and track your daily progress. It is designed to be easy to use and help you stay organized. It's two apps in one. Download it for free and start achieving your goals today! Millions know how to be busy, but not be productive. Goal Striver helps you prioritize, and focus on achieving your goals. 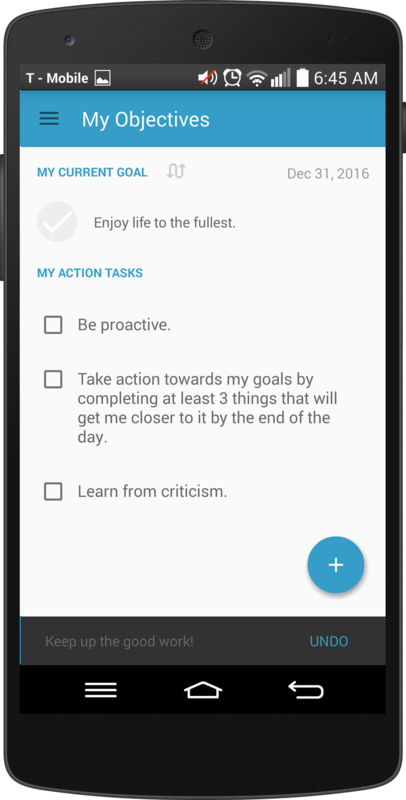 Unlike other productivity apps, Goal Striver is a goal setting app AND a to do list app, combined! See for yourself by downloading Goal Striver today. We encourage people to focus on a goal every day. Doing so will help you prioritize your time better, and have better control over the things you do. Goals don't achieve themselves; you do things to achieve them. Create Action Tasks so you can make daily progress towards achieving your goal - your daily action plan. Talk is cheap. You need to do whatever it takes to get you from where you're at, to where you want to end up. The key to success is to be persistent, consistent, and disciplined. Goal Striver is designed to keep your daily hustle in check through Action Tasks. Action tasks are tasks focused specifically on taking the necessary steps in order for you to make progress towards achieving your goals. Not only that, you will receive some words of encouragement each time you accomplish a task! See how you are doing everyday with Goal Striver's built in performance and metrics system. Goal Striver will keep track of your progress every day. After all, in order to successfully achieve a goal, one must be able to keep track and measure their progress. Set due dates and reminders for any task. With Goal Striver, you will never miss a deadline again. Keep calm, don't be late, and stay productive. 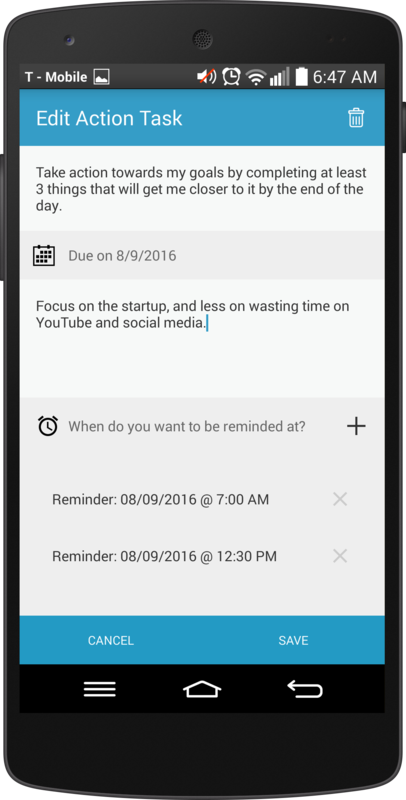 By the way, did you know that with our app, you can set multiple reminders for each task? Live life according to your standards, not by those set by others. Consistency, persistency, and discipline is key to achieving goals. Numbers don't lie. They don't sugarcoat the truth. 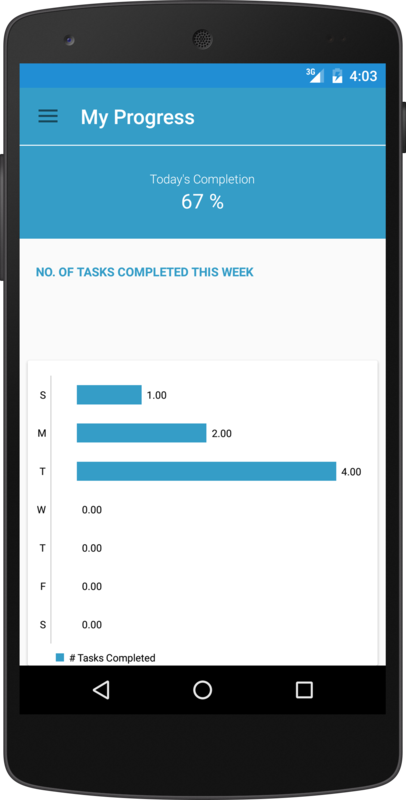 Track your daily performance. A due date helps you fight against procrastination and avoid missing another deadline. See your achievements that you accomplished during the year, and how long it took you. Easily store and access your list of goals that you wish to accomplish. It's easy to forget. With Goal Striver, you can set multiple notifications to remind you. Receive a positive comment everytime you accomplish a task! Ability to create regular tasks for the everyday, non-goal related tasks! "Some people dream of success, while others wake up and work hard at it." Receive useful articles about time management, productivity, and goal setting, as well as updates on what's going on with Goal Striver. Don't worry about spam; we hate it just like you do.